^ Traditionally, no royal bride has ever worn a see through dress with a slit up to their hoo ha while on an official engagement, nor have they put their hand on the inside of their royal groom's thigh while sitting on a dias on an official engagement. Seems things are a'changin' all 'round. I think the courtiers have given up on trying to help anyone anymore; clearly the new generation has completely collapsed all standards and neither prince have tried to better themselves and make a sincere effort. I think you are confusing the Field of Remembrance Ceremony with the Festival of Remembrance. The Field of Remembrance was done by the Queen Mum for most years post WWII before she handed it over to Philip in the 1990s and he handed it to Harry a few years ago. This is the ceremony, on the Thursday or Friday night where they plant the crosses. New wives do not traditionally attend this ceremony. The Festival of Remembrance is the event in the Royal Albert Hall that the Queen attends. 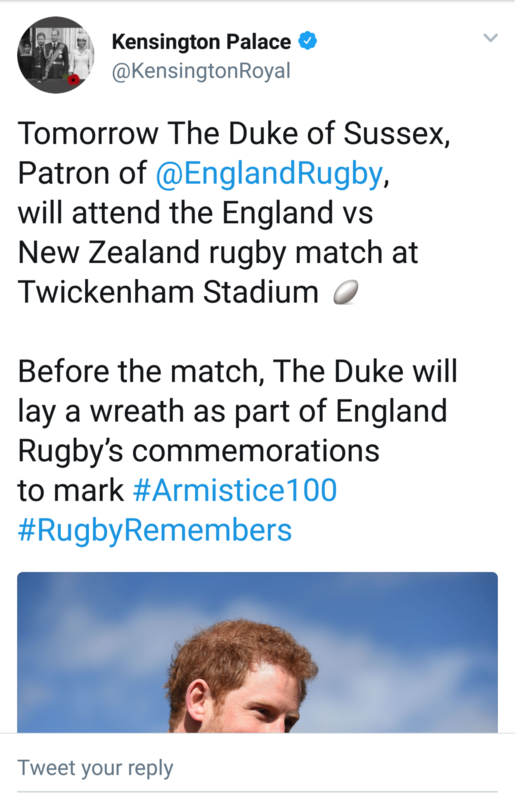 Last year neither William nor Harry attended as they both went to the rugby. I wouldn't be surprised if they both went to the rugby again next week - especially when Wales is playing Australia and England is playing New Zealand. All these countries have no issue commemorating their war dead by playing sport (both Australia and New Zealand also have cricket matches scheduled for the 11th November itself). Diana did months after she married Charles. She was already pregnant. Kate also attended. But as I recall they were on the balcony watching. The event you are describing is the event at the Centotaph on Remembrance Sunday not the Field of Remembrance event which takes place a few days earlier. 1. Field of Remembrance on the Thursday or Friday before Remembrance Sunday - usually only one royal attends although both Philip and Harry attended once or twice during the handover period. Diana didn't attend this event as Charles has never attended. This is the event when they fill the space near the Palace of Westminster and Westminster Abbey with crosses. 6. Usually an event at the arborotoreum - this is one where the Dukes of Gloucester or Kent usually preside although I seem to remember William doing it once. All events from #3 - #6 are on Remembrance Sunday. Harry has engagements by himself on Saturday, so he won’t be with his family at Rememberance service. I think he will go to both. I looked and this is at 15:00. I really do think Harry and Meg should give up on being taken seriously; a rugby match as a form of work? A day at work? I do think it is insulting when "fun" events like watching a game and partying with the team are considered "work." How standards have been lowered! Both brothers consider this work and it is the only work they do with enthusiasm and preparation. It's not like they're good for anything else. Neither were well educated or held to any kind of intellectual/academic standard and Harry wasn't held to any behavioral standards during his teens and twenties (crucial times to develop a personality) and so he didn't develop or mature. Also, since he doesn't have any of his mother's spark or gumption (something I believe has more to do with innate nature than anything else) he just devolved into a shiftless good for nothing loser. William went to uni, but we all know how that has turned out and go figure he is just as useless to his nation. But both brothers (and Kate) have been given patronages in sports that are important within British society; soccer, rugby and tennis. And when they appear at these games or training sessions etc they are performing their roles as patrons. I don't think any of them regard it as work as such, just as part of their roles as members of the BRF. Plus, these appearances at sporting events are recorded in the CC. Neither brother is responsible for what goes into the Court Circular and what stays out. It's the Queen who oversees this record and signs off on it. Do you know which member of the BRF attends the most Rugby matches as part of their work? Anne. She misses very few Scotland matches - either the internationals at this time of the year when the Southern Hemisphere countries are visiting or in the early part of next year when the six nations are taking place. She regularly travels to France or Italy for the day when Scotland plays there. The royals are attending because they are the patrons - just as they go to tennis, golf, sailing, the Olympics, the Commonwealth Games, the Invictus games etc. They are all sports and they are also involved at a very high level with the sport itself. Harry, like Anne, often travels overseas to go to sporting events and sometimes tack on other events. No one seems to criticise Anne for her sporting involvement - only the Wales princes and Andrew yet the Duchess of Gloucester and Duke of Kent regularly travel the world for tennis (and the Duke of Kent used to go overseas a lot when he was President of the FA - a position William now holds). Sport is a big part of the British and the Commonwealth cultures so it does make sense that the members of the BRF are seen at sporting events and take part in ceremonies at such events such as the laying of the wreath at the Rugby today. This is one of the biggest rugby matches of the year - the greatest international sporting team in history (winning record in international matches over the past century plus is at over 75%) against the mother country who invented the sport. For a country with a population as small as New Zealand to have a national team that dominates the sport - and a fully international sport played all over the world - is amazing. I personally am hoping for a great game and expect an All Black victory (and to make it a great ANZAC weekend I expect the Wallabies to defeat Wales as well). Going back into the 20s and 30s the then Duke of York was heavily involved in sporting events to promote healthy youth and was often seen at places like Wimbledon (he even competed in the doubles on year). When Prince Philip joined the family he took on a number a patronages to do with sport - some of his earliest e.g. 12th man of the Lords Taverners - which is a cricket associated organisation and he attended the test matches as work through the 40s up at least 2015 (I was at the Lord's Test when he attended and his standard was raised over the English dressing room). In 1988 Prince Charles came to Australia for the Bi-Centenary and included in that visit was a visit to the SCG for the Bicentennial test. He even brought the Ashes Urn to Australia so we could see it up close for the first time in over 100 years since its creation. In 1977 the Queen and Philip did a Commonwealth tour for the Queen's Jubilee - what was the crucial setting for the timing of the visit to Australia - the Centenary Cricket Test - the 100th anniversary of the first ever cricket test between England and Australia. The dates were set as the same ones from 1877 and the result was exactly the same - Australia by 44 runs. Sport and sporting patronages have long been a major aspect of the work of the BRF going back before the CC e.g. Queen Anne and her connection to Ascot continues to this day, Edward VII also was a regular at the races and again it was work. The Queen herself has rarely missed the sports that she enjoys and no one seems to criticise her for classing 6+ days a year at the races as sport as she has done for her entire reign. It seems it is only the Wales princes who are criticised despite the fact that it is a tradition within the family going back at least into the early 1700s that watching and participating in sport is part of the work of the BRF. Princess Anne works her a$$ off in a regular and steady way. Same goes for HM and PP. It’s called balance. I don’t begrudge Anne or any of the steadfast royals a minute supporting a sports event. Harry or any of these swanning around young royal brothers pale deeply by comparison. These patronages that the Wales brothers and Kate hold though have been appointed to or have inherited from other royals. None of the younger royals (or older ones) would go around saying 'I really love watching tennis...or rugby...or soccer, so I'll have that position, thanks!' All patronages are shared and handed around the royal family, however many engagements each individual performs each year. And if the Queen didn't wish those sporting patronages to be given to the younger royals they wouldn't be. The older royals work hard now but ... when they were younger they started with sporting patronages as they were young and fit e.g. Philip's first patronages when he became a royal were to do with sport and promoting sport (National Playing Fields and cricket). Anne started with equestrian and sailing events amongst her first engagements - even before she became a full-time working royal in her early 30s. She built up her workload over the decades but she started with more sporting ones and Save the Children. The Wales boys are starting much the same way - largely sporting with some serious ones but adding more and more serious engagements etc as they get older. It is the way the BRF works. Makes a lot of sense and maybe this is the big problem that brf has. Exhibit A: William, Harry and their wives counting shopping for a see through dress as hard work, or 45 min engagements and not every day as work, thinking that they are influential while they are not. Sad day for humanity.